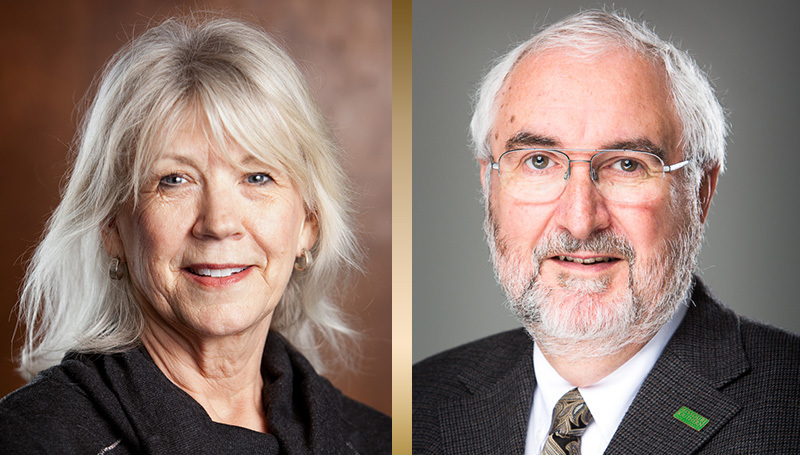 A special retirement ceremony for Dr. Richard Miller and Dr. Deborah Brown is slated for 4 to 5 p.m. Thursday, April 20, in Room 125 of the Criminal Justice Center. Miller arrived at Missouri Southern in 1985 and, over the years, has served as an assistant, associate and full professor. He chaired the Social Science Department for 13 years and has served as Dean of Arts & Sciences for the last nine years. He received his bachelor’s degree at Henderson State University, his master’s at the University of Memphis and his Ph.D. at Oklahoma State University. Miller will be entering phased retirement, but will teach and serve as director of the Disney Internship program. Brown came to Missouri Southern in 1993. Over the years, she has served in a variety of academic and administrative positions including assistant professor, professor, department chair and graduate program coordinator. In 2015, she was named the school’s interim dean, and full dean in July 2016. She received her bachelor’s degree from Southwest Missouri State University (now MSU) and obtained her master’s degree and Ph.D. from the University of Missouri-Columbia. Prior to entering higher education, she worked in the public school system. Brown plans to enter full retirement. Faculty, staff, students and friends are invited to the retirement ceremony for these longtime members of the Missouri Southern team. NextStep It Up Challenge: We’re almost to the first goal!